I love to walk. In fact, it is one of the things that makes me happiest in life. I was recently sent a Boba carrier to try out which has been amazing for walks. For my review, I chose the vail patterned Boba Carrier 4G to try out. This carrier retails for $125 and has many different colors/patterns. What I really like about this carrier is that it has different options for different sized babies. For example, since my daughter is very small right now, the insert gets snapped on a certain way. Once she gains a little more weight, the infant insert is then unsnapped a different way. Once she is big enough, the infant insert gets removed. It is very versatile and easier than many carrier to use. 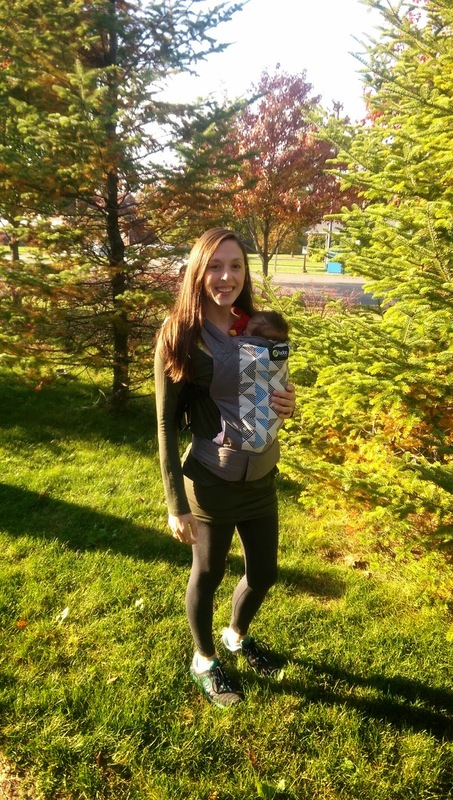 The Boba carrier includes a sleeping hood and removable foot straps. It can be used from 7-45 lbs and is great for infants and toddlers. It fits heights from 5' to 6'3" which is awesome. So far, I have worn this carrier a few times and really like it. It is comfortable and I love the cute pattern. My brother was in town recently and wanted to wear Adalyn on our walk and did so! It was so funny to see my brother wearing a tiny baby. He said it was comfortable and enjoyed wearing her. Since I am breastfeeding, when I am in public, I think about how I would feed her if I need to. This carrier has a special adjustment for breastfeeding which I'm sure will come in handy. Something else neat is that the carrier has pockets to be able to store a few things which is great. I would throw a pacifier in here along with a travel wipes pack and 1 diaper in case of emergency. We are very happy with the Boba carrier and I know that it will get a ton of use.